Do You Really have a Refrigerant Leak? A new customer recently told us about calling her HVAC repair company because her system wasn’t running cold enough. When the technician arrived, he said it needed cleaning and also that it was low on refrigerant. She gave the green light for the cleaning and serving. But, when it came time to discuss refrigerant he told her that the system had a leak, that fixing it would be expensive, and he wasn’t supposed to add refrigerant without the repair. Then he said he happened to have enough in his truck to add it to her system without reporting the leak to his company. She let him and tipped him generously. Of course, she never had a leak in the first place. Custom Climate Concepts doesn’t want anyone, customer or not, to be in that situation, not knowing the facts. That’s why we’ve put together some FAQ’s about refrigerant. Also, be warned that anytime a technician offers something ‘ ’off the books” you are very likely being scammed. A. Refrigerant is essential to how an air conditioner run. It is a chemical that’s designed to remain at the same level (charge) in the air conditioner for its entire lifetime. 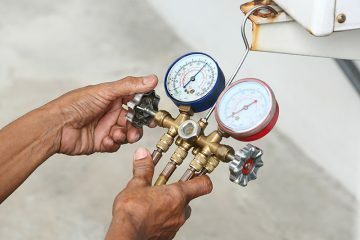 As the refrigerant moves through the system, going from the compressor to the outdoor coils and then the indoor coils, it goes through a process of condensation and evaporation. Its pressure rises and falls, it loses and gains heat, it goes from liquid to gas form and back again – and doesn’t dissipate at all during the process. Q. How can I tell if there IS a refrigerant leak? A. The refrigerant ‘charge’ of an air conditioner can drop if the refrigerant lines (NOTE bullets format) Develop leaks. Signs to look for include: A decline in cooling capacity Ice appearing along the evaporator coils A hissing noise from the cabinet. If you suspect a leak, call Custom Climate Concepts right away. Not only does the proper amount of refrigerant need to be added (too much refrigerant is a bad as too little) the leaks must also be located and patched. Q. I heard the Environmental Protection Agency (EPA) has banned the use of refrigerant. Is this true? A. The EPA decided to ban the use of a specific chemical called R-22 and has been phasing out its use. The production of R-22 refrigerant was dramatically reduced in 2014 and will continue to reduce each year. Production and consumption of R-22 refrigerant will be totally phased out by 2020. Q. What happens in the future if my HVAC system needs more refrigerant? A. There are three choices. (NOTE: Number list format) Continue with R-22 refrigerant as long as it is available, but the cost per pound is high and continues to increase. Replace R-22 refrigerant with an alternative EPA approved HFC refrigerant. The cost for alternative refrigerants is lower, but it does require labor to fully evacuate the R-22 refrigerant and replace with the alternative refrigerant and may require the replacement of some parts. Consider purchasing a new, modern, energy-efficient HVAC system that already uses newer refrigerant.